WELCOME TO HOLDERREAD WATERFOWL FARM AND PRESERVATION CENTER, located in the picturesque foothills of the Pacific Coast mountains in Oregon. 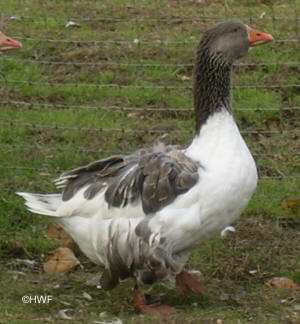 We have enjoyed raising and studying domestic geese and ducks continuously since 1961. We specialize in purebred waterfowl that possess a unique blend of superb production and exhibition qualities. Birds bred by us are exceptional layers, fast growing and have won top honors at the largest poultry shows in North America and Europe, including Supreme Show Champions at the American Poultry Association's annual National Shows. Our breeding program encompasses more than 20 heritage goose varieties and 40 heritage duck varieties, including some of the world's rarest and most unique breeds. 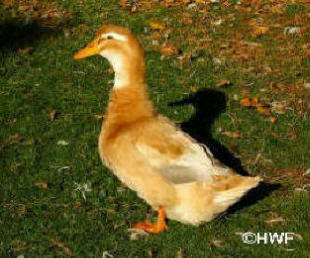 ONLY ROBUST DUCKLINGS, GOSLINGS AND MATURE BIRDS ARE SHIPPED and each order is prepared with great care. Our duck and goose hatchery produces day-olds from early April until mid June. During the past four and a half decades, we've supplied purebred ducks and purebred geese to satisfied customers throughout the United States, Canada and Puerto Rico (orders to Canadian customers are shipped to the stateside town of choice). BOOKS AND BULLETINS COVERING MANY WATERFOWL TOPICS can be ordered from our catalog. Titles include Storey's Guide to Raising Ducks, The Book of Geese, Managing Ducks For Top Egg Production, Wing Disorders In Waterfowl and How to Prevent Them, and bulletins on many individual breeds of ducks and geese, all written by lifetime waterfowl breeder, researcher and historian Dave Holderread in his easy-to-understand writing style. Propagating and conserving heritage varieties of domestic waterfowl and making them available to the public. Producing the best quality stock possible. Conducting long-term studies that document the unique physical, behavioral and production characteristics of each variety we raise. Preparing accurate and detailed literature on the history, physical characteristics, behavior, management, breeding and genetics of domestic waterfowl. Exploring ways to humanely raise farm animals while improving habitat for wild plants and animals. We treat our animals with respect and provide an environment that allows them to live as naturally as possible. We do not kill surplus birds. We actively work at improving habitat for native flora and fauna . We protect our birds from predators through management and deterrents, rather than trapping and killing. If at all possible, we do not use sprays to control pests and unwanted vegetation. We maintain health through proper nutrition and a healthful environment, rather than the routine use of antibiotics or other pharmaceuticals. INTERNATIONAL POULTRY SPECIALIST HANS SCHIPPERS of the Netherlands has traveled the globe collecting material for articles and books. Hans has visited our Preservation Center twice to photograph our birds. He stated that we have one of the two best collections of domestic waterfowl in the world--one in Europe had the largest number of varieties, ours had the highest over-all quality. 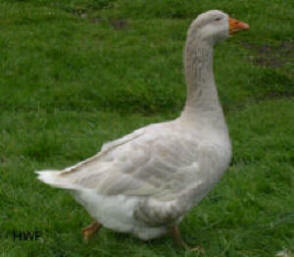 PEOPLE FREQUENTLY TELL US that the ducks and geese they purchase from us are the most robust they've seen. We attribute this exceptional vigor to the meticulous selection of our breeding stock, our premium feed formulas that closely duplicate the natural diets of wild waterfowl, and our spacious pastures, pens and ponds where our web-footed friends delight in fresh air, exercise and the opportunity to forage for live food. We work very hard to make it possible for our birds to have an enjoyable life that is as natural as feasible, while protecting them from predators. PRIMARY FUNDING FOR OUR PRESERVATION WORK comes from the sale of birds and donations from people who share our interest in saving endangered waterfowl from extinction. 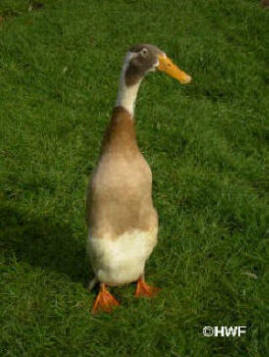 Maintaining such a large genetic stock of ducks and geese is a time-consuming and expensive undertaking. To increase their chances for long-term survival, we keep a minimum of three strains in every breed raised here. By becoming a Waterfowl Preservation Partner, you can sponsor individuals or groups of birds, thus becoming an integral part of our conservation work by increasing the number of birds we are able to maintain at The Preservation Center. WE'RE BUILDING THIS WEBSITE (which is a work in progress) to provide an overview of the various components of our work and to illustrate with colored photos many of the varieties we are breeding and studying. All photos were taken here at The Preservation Center; more will be added as we have time. The birds were photographed in their pens and were not fitted or altered prior to being photographed. We have tried to make sure that the colors accurately portray what the birds actually look like, but keep in mind that computer monitors vary considerably in their color reproduction. All of these photos are copyrighted by Holderread Waterfowl Farm and Preservation Center--please do not use without permission. WE HOPE YOU WILL ENJOY the beauty and energetic antics of these web-footed treasures along with their many practical qualities. A flotilla of waterfowl on a pond or a gaggle in the yard becomes a bona fide home entertainment center when you take the time to watch. Happy duck and goose raising from all of us here at Holderread Waterfowl Farm and Preservation Center.